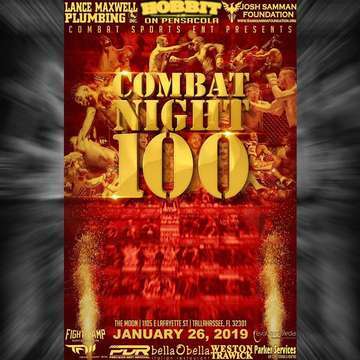 Combat Night began 7 years ago at the Moon nightclub in Tallahassee, FL. We have put together over 90 amateur events and provided opportunities for over 1,300 fighters in that time. It is with great pride that we come back to Tallahassee for our 100th show. Weigh ins will be held at Hobbit American Grill on Pensacola street at 5PM on Friday, January 25th. The fights will be the following day with the doors opening at 5PM. We have a stacked card with the best amateur and professional talent in the state!